Last month, a friend of mine came to me for help. Apparently, she made an impression unto some figure of note and now the person expected to see her entry for the National Bento Competition. Strangely so, this friend of mine is not much of a cook and asked for my help with the competition (not that I was any better but if we put it in cooking mama terms, she rarely saves my dishes for me. ^^;;). The entry was in my name but it’s an entry for their group, something of that sort. I’m not much of a bento cook because I’m little miss rustic, but hey, why not. Bento’s still all about food. And since I wasn’t the one who was spending for the ingredients, I agreed to do the job. To my chagrin, the job was not as easy as I had thought. The idea was a Spanish Bento. The bento had potato fritata, asparagus and enoki wrapped in pork strips covered by a blanket of Spanish Sauce, tomato ensalada cup, saffron rice, and oranges. Cooking the bento was easy since there were tons of recipes online and ingredients were available. The problem was the contest had menial details like recipe, portions, and cost. TAT;; Things I barely even think of when I make my food. Sure, I think of the cost in total, but not per dish. Same goes for recipe wherein a dash for me could be a pinch to somebody else. It was hard in that manner, but in the long run, it was an experience I’d probably try without having to think of the technicalities of it. I told Kao that this would probably be my last bento. Maybe the last bento for the competition, but for sure, I’d definitely be making far more relaxed bentos without *cough* the pressure of the competition. For me last night’s yummy dinner would be just as good as today’s bento. Sure, some person out there would think that I don’t have the love to prepare for bento, but between catching time to read my manga and making bento, I’d go with my mangas. They need some love. Wow, this is great! 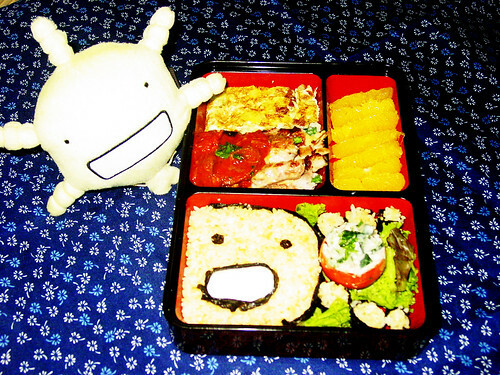 So I guess a lot of moyashimon are floating on this bento itself! nice bento! you should have joined that bento competition at the shang. akin na lang yung moyashimon mo? hehehe. I did! But hindi sya naging finalist. ;A; If Kaoko joined, she would have! I’m sure of it!